This is a variation of the GDImage 4.00 Carousel demo that I did to check altogether with the BassBox OpenGL visual plug-in. 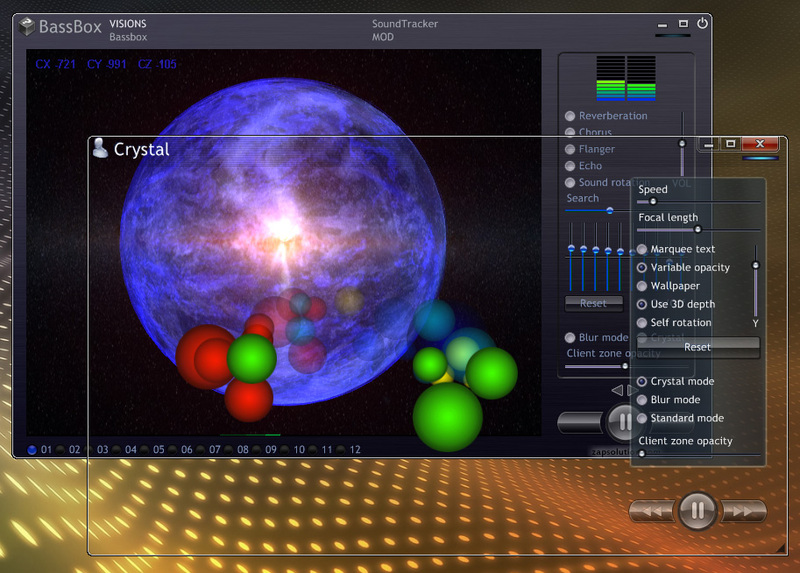 I am very excited by the composited feature of VISTA's DWM, it opens so many perspectives to create amazing graphics. To see what I mean, start BassBox then drag the Crystal window hover it, then play with the command setup, do you get the picture? Patrice does this need Vista in order to run? I am curious to see what happens, is there a screenshot in case I can't run it? Well I didn't check it on XP. The speed of GDImage should be same. GDImage alone should work already in "XP AERO GLASS" mode (as shown in the "SDK Programming" section). Crystal itself is working well under XP. What is neat is, I can move the window while the animation is playing and it is being updated the whole time the window is moving. No dark screen or frozen image as with OpenGL doing this sort of thing. The speed can go super fast that is for sure too! and the same change also apply to the VISTA version. By the way, are you aware that you can move the sprites around with the mouse while in pause mode. GDImage knows at any time which object has the focus, and which one is hover by the mouse. You can also select several objects altogether, holding down the left CTRL key while you select the object with left mouse, once done you can drag the selection to another location, or retrieve the selection to do what ever you want with it. Version 4.00 is able to manipulate 1024 objects per control. The new Crystal version is attached to this message. Oh wow, very very nice Patrice, thanks! That looks very cool Patrice!